The Australian interiors that combine these covetable decorating styles. What makes Australian interiors so inspiring? The seemingly, it’s-always-summer detail for one, its approachability and focus on laid-back living, another. We’d like to think that the aesthetic stems from the marriage of Scandinavian design and the California-cool vibe we just can’t get enough of. 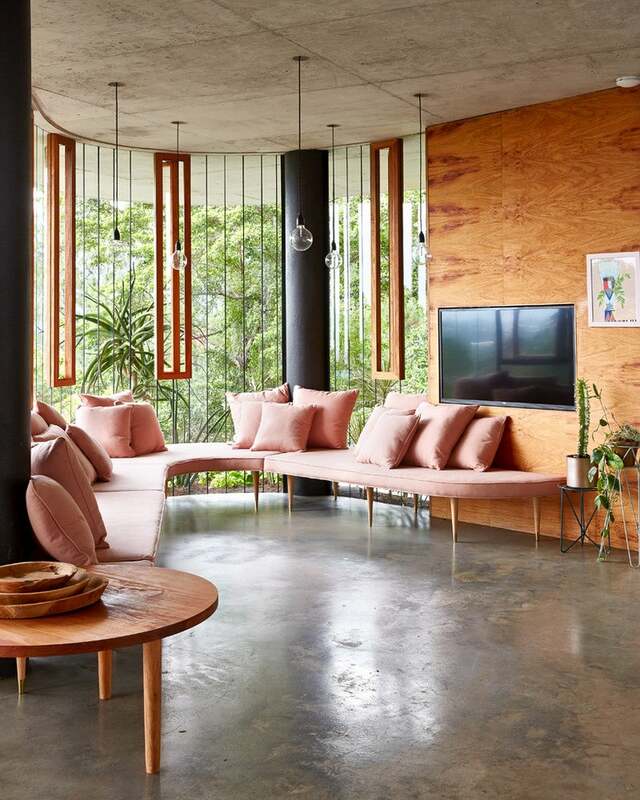 With streamlined furnishings, monochromatic palette , and curation at the forefront of the decorative styles, we rounded up a few of our favorite Australian spaces that do the aesthetic justice. Take a look! A light-filled kitchen definitely calls for a whitewashed scheme, especially when paired with a vibrantly green surround – located at the exterior. Not only does the look emulate an effortlessly chic ambience, it provides room for bold color moments. Here, a pair of wicker baskets double as both a storage solution and a detailed accent piece. For the minimalist space in need of a little revamp, consider bringing in furnishings that come in a vibrant color play. In this charming vignette, the blank wall functions as a canvas for the carefully curated and bright, decorative accessories. A sea-inspired scheme transforms this contemporary bedroom into a dreamy retreat, complete with bright blue bedding and streamlined decor accents. We’re still not over our obsession with blush-toned sofas, and this elegant, wrap-around piece is no exception. Paired with a rich wooden backdrop and polished, concrete flooring, the result is an approachable take on a contemporary design. Working with a monochromatic palette? Don’t feel constrained to a reserved color scheme. Filter in a modest handful of colorful accents to extend depth to the scheme. Accent pillows, wooden coffee table trays, and fresh flowers (always interchangeable!) are great places to start. A serene bedroom starts with a subdued palette layered with texture and soft color accents. A cozy mix of linens, jute, and fresh florals complete this light and airy space. We love it when the outdoors contribute to the overall decor! Within this light-filled dining room, an absence of color is more than made up for by the warm wooden furnishings, matte black accents, and woven textures. Take your favorite color block to the walls! A saturated shade of cobalt sets a playful backdrop for the vibrant, decorative accents of this cozy nook. Psst! It even extends along the molding of the adjoining rooms, setting in a subtle yet dynamic color detail to the home. A home office doesn’t have to be snoozy or clad with the typical office findings. Bring in cool textures and unexpected details to elevate the space, creating a more efficient (and style-focused!) workspace. A monochromatic palette of soft greys and understated blues extend a soothing element to this open-layout space. Saturated versions of the base colors elevate the scheme, promoting a well-balanced design product. We’re all for swapping the classic subway tile in lieu of this centric motif. Its structural pattern evokes an element of added depth to the wooden vanity, seamlessly blending in with its contemporary surround. Paired with drop glass pendants (and that ultra chic settee in the back!) this bathroom is about as perfect as they come.